Online shopping can be a pain. Sometimes you don't know where you shop or you just can't find that specific thing to complete your wardrobe. I compiled a list of my favorite sites that can make you into an online shopping pro and get the deals and clothes you want without breaking the bank! Shopstyle is all about letting you control what you want instead of the brand or store. By showing you a curated list of products that match the specific item you want, you can shop within your budget from thousands of stores all in one place. So if you want a red and white striped shirt that’s under $25 in an extra small, ShopStyle will go through thousands of stores and find you all the shirts that meet your standards. Be wary that search results depend on how stores tag products, so you might miss that one red and white striped shirt that's not tagged as such. If you are exclusively a online shopper, this site is perfect for tagging items and getting alerts for when prices drop. No more going through thousands of sales items just to see if that dress you had your eye on is somewhere in there. There are two ways you can use ShopTagr. You can use the website to see all your tracked products and the latest trending deals, or download the website extension. The website extension is amazing! You can be browsing on Anthropologie to find a top that you really like, and you can just tag the item from the ShopTagr extension instantly! If you love Google for their search abilities, then you'll love Google Shopping. Especially if you’re looking for brand name clothes. Trying to find the cheapest pair of Jeffrey Campbell boots without spending hours on trolling shopping sites? Google Shopping will help you find all the pairs so you can get the lowest price. While Pinterest may not be the most obvious way to online shop, there is value in using its guidable search function as it can give you great inspiration. Much of what anyone wants they usually pin, so If you have been pinning clothes, jewelry, accessories and more, you'll realize there are clickable links. Those links can help you figure out where to purchase those items or connect you with new sites and more products you like. This is the fashionable college student’s holy grail for student discounts. You get your own personal code for online stores like Asos, All Saints, Ann Taylor, ModCloth and much more. Discounts range from 10% to 25% for various stores. Not to mention they are always giving out gift cards and other prizes. 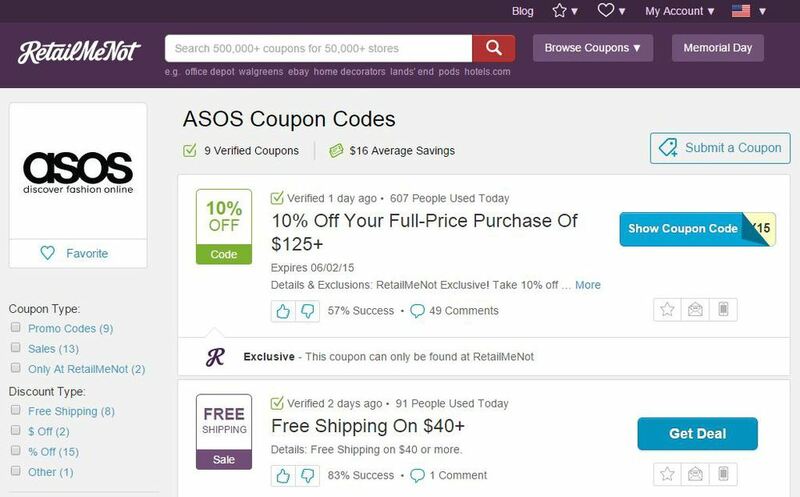 A top site for finding the latest deals and coupon codes for every kind of store you can think of. I always do a quick check on Retail Me Not for codes before I order my items. Sometimes they have their own exclusive codes that stores may or may not announce, so it’s great for hidden deals. If you know of anymore helpful shopping sites, please feel free to share them!